To search for obituaries in our online catalog, please follow the instructions below. 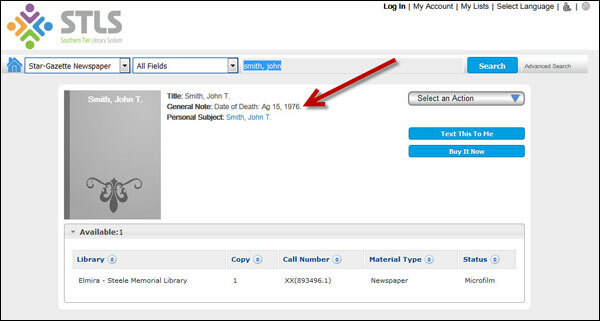 We also have a separate index of obituaries from 1898, 1899, 1900-1960, 2015 available on our website, as well as a list of “problem obituaries” that do not display properly in our online catalog. Step 2: To view the record, click on the name of the person you are searching for. Step 3: The date of death / date of the obituary should be listed under “General Note”. To search for obituaries, enter the last name, first name.